Ultraviolet (UV) Plano-Convex Spherical Lenses are available in high purity UV Grade Fused Silica for imaging applications from ~180nm to NIR. UV Plano-Convex Spherical Lenses have one flat (plano) surface and one spherical surface curved outward (convex) to converge the UV transmitted rays from an object, thus forming a real or virtual image of that object. A UV Plano-Convex Spherical Lens is used as a simple imaging lens to focus, collect and collimate UV light. UV Plano-Convex Spherical Lenses have positive Effective Focal Lengths calculated at popular UV wavelengths below. UV Plano-Convex Spherical Lenses are generally used as a focussing element within an UV optical assembly, UV instrument or UV laser. Chamfer: ~ 0.25mm @45 deg. More information on UV Grade Fused Silica can be found on our Material Properties Page. 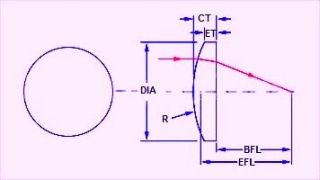 For more information about Spherical Lenses, refer to our Optics Tutorial page.